Happy Mardi Gras everyone! 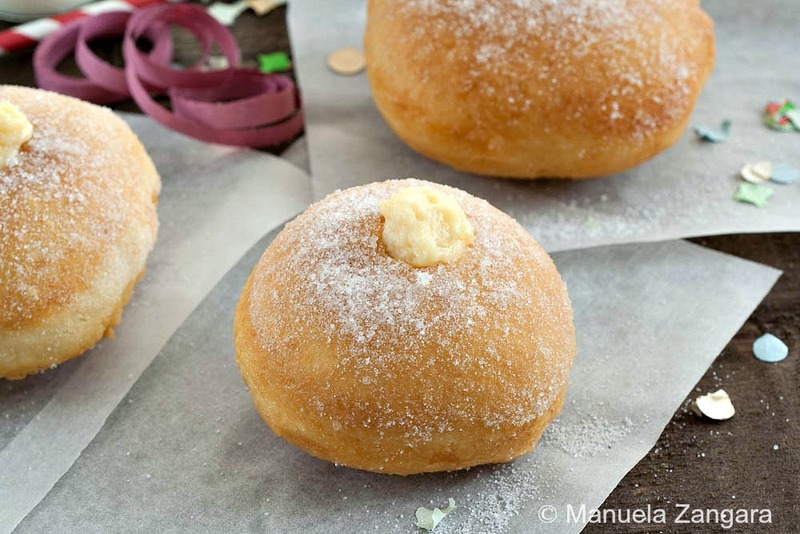 As promised in my last post about Ravioli di Carnevale, I am back with yet another delicious treat that is perfect to make and eat this time of the year: Bomboloni alla Crema – aka Italian doughnuts filled with pastry cream. To be truthful, Italians eat Bomboloni all year round, but as we tend to consume more fried food at Carnevale, these fit the bill perfectly. These doughnuts are my all time favourite and I like them just like this: filled with crema pasticcera. 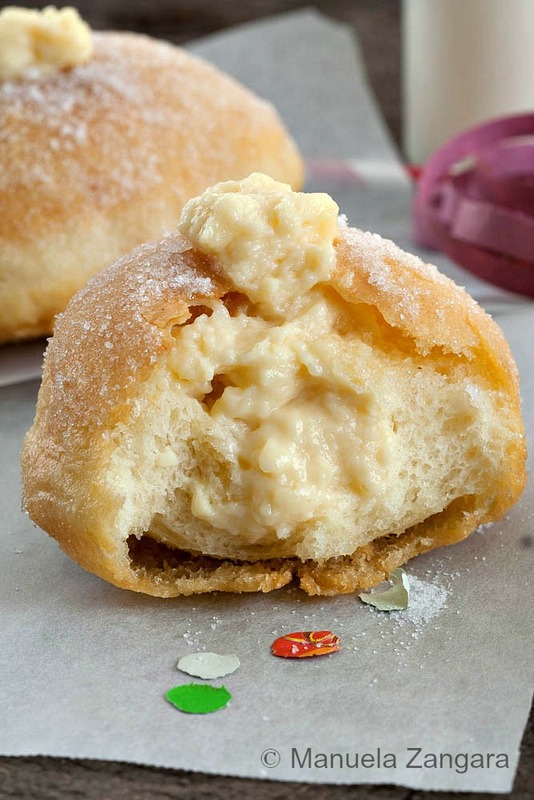 There is nothing better than biting into a warm, airy, light, spongy doughnut with a sugary crust and find this delicious and silky cream inside. I love these as they are not overly sweet. There is very little sugar in the dough itself, which is perfect as they then get coated in superfine sugar! I really don’t like doughnuts that are too sweet. I find these work very well as all the flavours are balanced and you actually get to taste both the dough and the filling! I used to buy Bomboloni at the bakery near my house when I was a child… they were such a treat after school, so comforting and homey! As I cannot find any here in Sydney… I make my own. I first saw this recipe in my friend Grace’s book Grace’s Sweet Life: Homemade Italian Desserts from Cannoli, Tiramisu, and Panna Cotta to Torte, Pizzelle, and Struffoli . For the few of you who do not know her, Grace blogs at La mia Vita Dolce and she makes the most AMAZING Italian sweets. Yep, and they are all the “real deal”, I have tried them. Her book is highly recommended and, if you like Italian desserts like me, it’s actually a must-have! When I made Grace’s Bomboloni for the first time, I was blown away… not only by how good they tasted, but because they were exactly like the baker’s Bomboloni of my childhood. They brought back sweet memories with every bite and I just could not stop eating! I have made them many times since then, and they are always a huge hit! The doughnuts come out perfect: soft, airy, light and the filling… ohh the filling! You just need to make them to understand!! Happy Carnevale… have fun and eat well my friends! 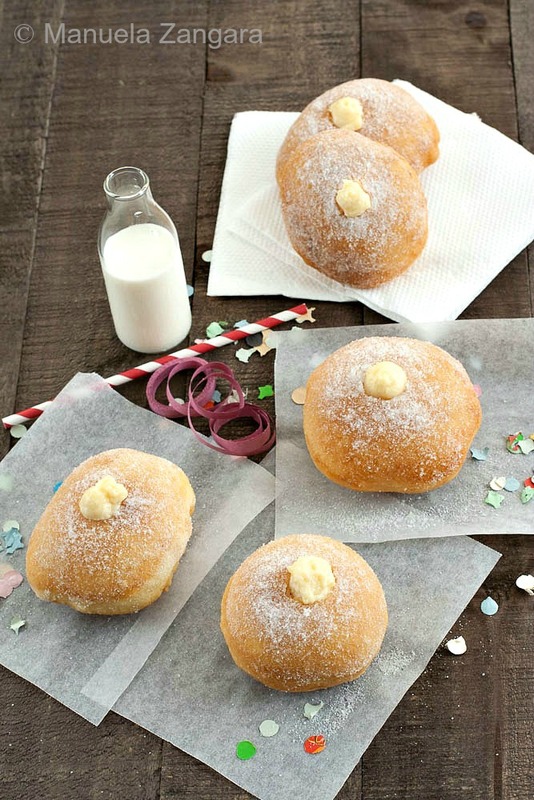 Bomboloni alla Crema - Italian fried doughnuts filled with pastry cream and coated with caster sugar. 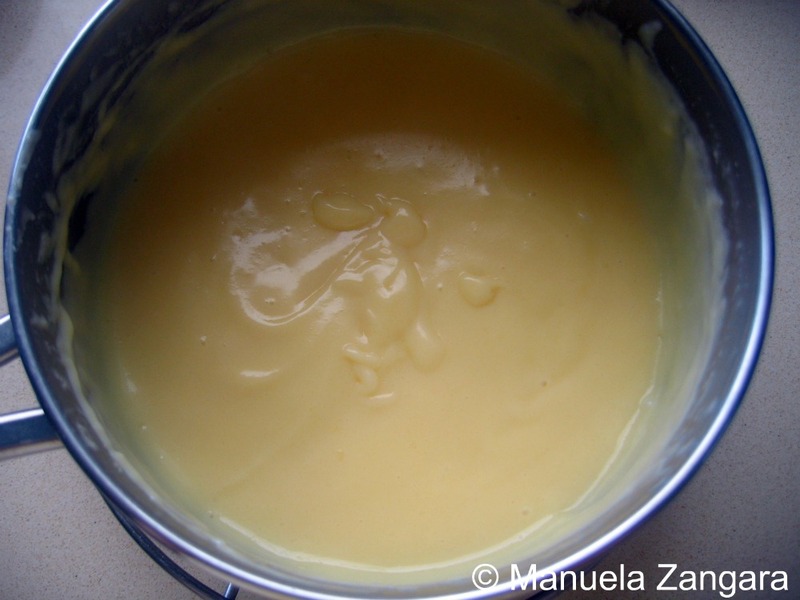 Using an electric mixer, whip the egg yolks with the sugar until white and fluffy. 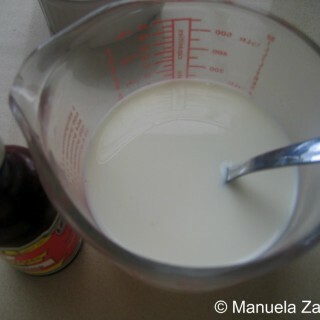 Slowly add the milk to the above mixture and keep whipping. Then add the sifted flour and whip well. Transfer the mixture into a pot, put it on the fire and bring it to a boil. Simmer for a few minutes, stirring continuously with a whisk, until the cream thickens. 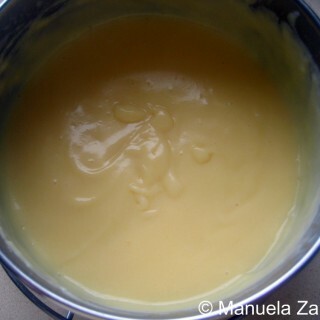 Transfer the cream to a bowl and cover it with cling wrap (make sure the cling wrap touches the cream’s surface as this will prevent a film from forming). Let it cool down before using it. Put the flours, sugar, instant yeast, vanilla extract (or vanilla bean seeds), lemon zest and salt in the bowl of an electric mixer fitted with the paddle attachment. Mix them to combine. Pour in the warm milk. 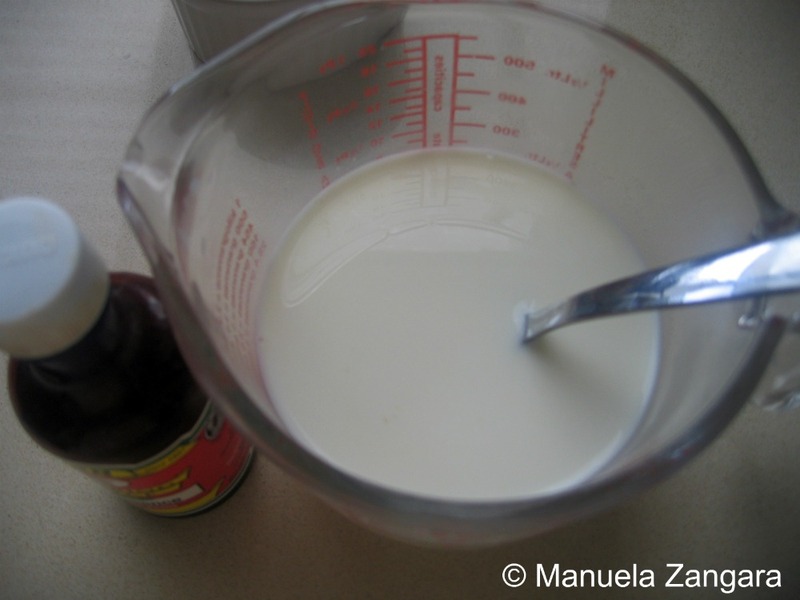 Quickly knead the milk and the dry ingredients together. 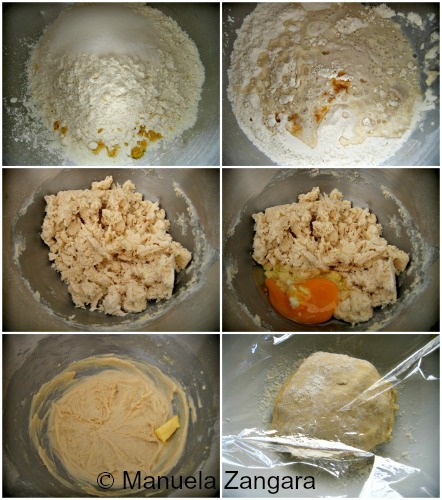 Add the eggs all at once and knead until you have a rough ball of dough. 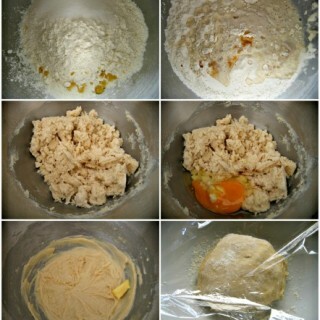 Gradually add the butter, one piece at a time, working each piece of butter into the dough before adding the next. Knead until the dough becomes smooth and elastic (but not sticky). This will take about 10 to 15 minutes. Make the dough into a ball and transfer it back to the large bowl, cover it with a sheet of plastic wrap and leave it to rise in a warm place for 1½ to 2 hours, or until doubled in volume. While the dough is proofing, cut square sheets of baking paper of about 11 cm – 4.5 inches. You will need these to rest your cut out rounds of dough. 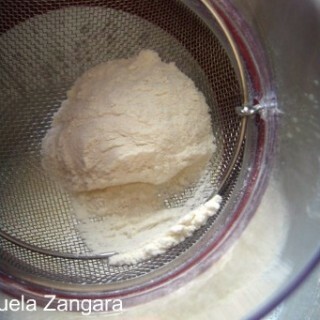 When the dough has doubled in volume, transfer it to a clean, floured surface. Using a cookie cutter or glass, cut out rounds about 7 cm to 7½ cm (2¾ inch to 3 inch) in diameter (keep the cuts as close together as possible). Gather up the leftover pieces, give a quick knead to bring the pieces together, return the dough to the bowl, cover and leave to rise in a warm place until doubled in volume, about ½ hour, and then proceed to roll out and cut out other rounds. Repeat until you run out of dough. Put the rounds on a deep baking tray lined with the sheets of baking paper (sprayed with vegetable oil spray) that you prepared before. Cover the baking tray with a sheet of plastic wrap and leave to rise in a warm place until doubled in volume (they should appear full of air, rising time is about 1½ to 2 hours). Make sure to use a deep baking tray as this ensures that the tops of the bomboloni will not stick to the plastic wrap: if they do, they will deflate when you peel off the plastic wrap. Heat the sunflower oil in big pot over medium heat to between 160°C and 170°C (320°F and 340°F). (Check your oil frequently while frying bomboloni to maintain these temperatures). Prepare 2 large plates for the draining and rolling of your bomboloni. Layer one plate with 3 to 4 sheets of paper towel for draining, and the other plate with a thin layer of caster sugar, for rolling. 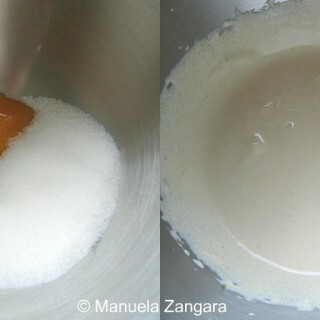 Carefully transfer the bomboloni into the hot oil by dipping them in the oil WITH the paper. 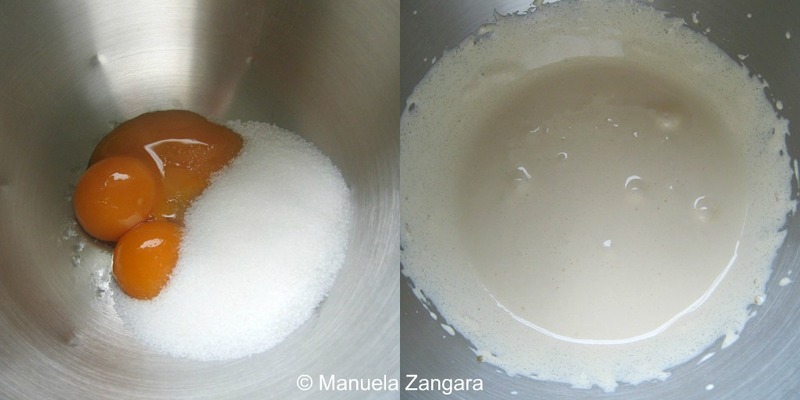 Remove the paper within seconds from the hot oil and continue frying the bomboloni as usual. With this method, you will get fluffy bomboloni and you will not change their shape. Fry four to six bomboloni at a time to ensure even frying. Fry until golden on both sides (this will take 3 to 5 minutes). Remove them with a slotted spoon, drain them on the paper towels and immediately roll them in caster sugar until evenly coated. 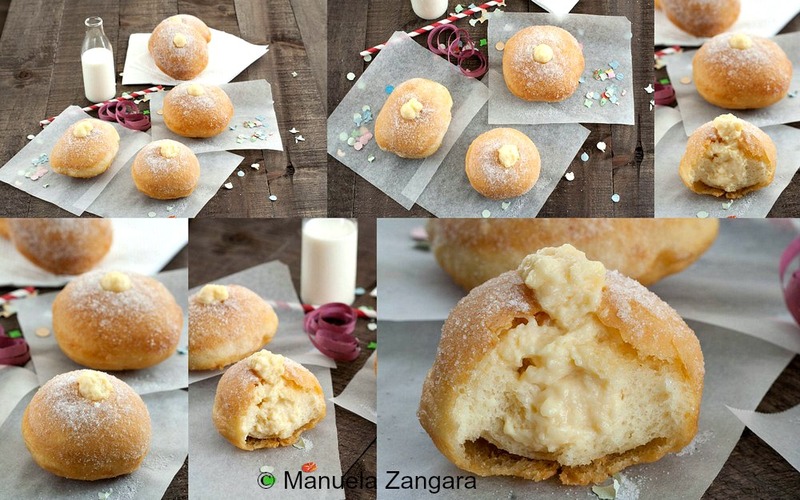 While the bomboloni are still warm fill them with Crema Pasticcera. To fill the bomboloni, transfer your Crema Pasticcera to a large pastry bag fitted with a ½ cm to 1 cm (¼ inch to ½ inch) plain round tip. Use a sharp paring knife to make a small hole in the centre at the top of each bombolone. Insert the pastry tip into the hole and pipe the cream until the bombolone feels heavy and you have a mound of pastry cream visible on the top of the bombolone. 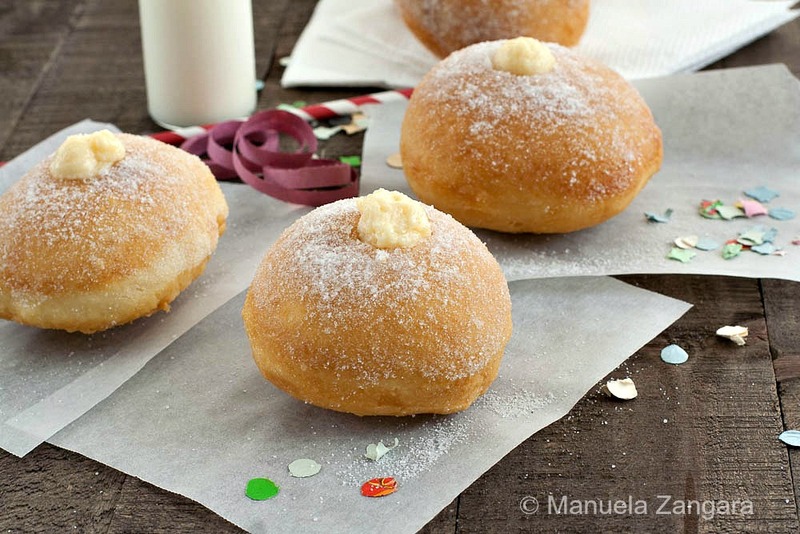 Bomboloni are best enjoyed on the day they are made. Serve immediately. *In the spirit of full disclosure, this page contains an affiliate link, which means that I may get a commission if you decide to purchase anything from the site above. Buon martedì grasso! I just posted a picture of carnival treats with streamers and confetti… how funny! I love bomboloni!!! Yum, more fried goodness! And I couldn’t agree more, I dislike sweets that are too sweet. Balance is key. These remind me a bit of a deep fried treat that we used to enjoy for St. Joseph’s Day in Rome, called bignè di san Giuseppe. They were wonderful. I also dislike sweets that have too much sugar. I love crostoli, I make them often. Thank you ever so much for giving not only the metric measurements, but the others also. I was so excited to see the recipe and extra excited that I would be able to make it without spending the day translating the measurements. i love bomboloni. they look great! I was wondering if there is any way to get a signed copy of G race’s cookbook? I would love to have one if at all possible. Please let me know. Thanks for sharing this recipe and cookbook! Your bomboloni look amazing! One of the things I enjoy about food blogging is being able to share family favourites but what I enjoy even more is when others enjoy them as much as we do, I’m so happy that you and your family enjoyed them! Hi Bea. If you could send me an email (graces @ gracessweetlife.com) with your mailing address it would be my pleasure to send you a signed copy. Just yesterday I was on the cooking channel’s website and found a video about Bomboloni. Looks like I’m meant to have these in my life! I tried this recipe today and when I cut the dough into circle shape they hold nice shape but when I put it into proofing they became a big circle with thickness less than 1 cm, not like your picture. What did I do wrong? It sounds like there was a problem with the yeast. Did the dough double in volume before you rolled it? Did you leave it to proof for a second time after cutting the rounds? Maybe the air temperature was too cold/humid and it interfered with the proofing? may I use 500grams of all purpose flour in the absence of bread flour? Che bella ricetta! Grazie. Ti faro’ sapere se la provo fare. Sono americana ma ho visuto quattro anni in italia. Mi fa piacere trovare la ricetta per i bomboloni, che ricordo di aver mangiato a volte quando stavo a Roma. Grazie mille per il messaggio! Sono molto contenta che ti piaccia la ricetta dei bomboloni (io li adoro! ).